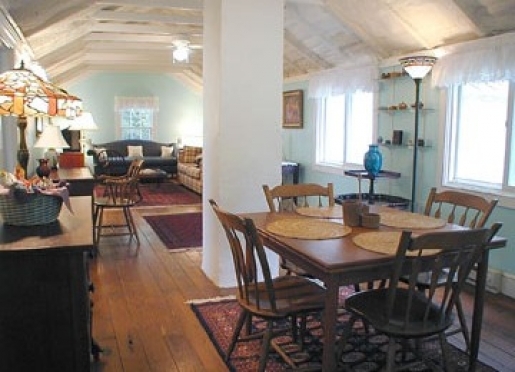 This fully equipped charming Virginia cottage is a separate small house located next to the main house. The cottage pricing is for up to 4-person occupancy. A cot or crib can be added for a fee of $25 per person per night. The cottage is ideal for family vacations, guests traveling with pets, and anyone who wants additional privacy. It is our most popular accommodation. The Iris Room is on the first floor of the main house and is in the oldest part of the house (circa 1805). In fact, this room and the room above it (the Violet Room) comprised the original house, which was a log cabin. The large fireplace in the Iris Room (which now has an electric insert) was where the cooking took place. The Iris Room is our most popular room in the main house. The Daisy Room is on the first floor of the main house and is in the "newest" part of the house (from the 1870s). The Daisy Room is located on the east end of the house and has windows on two sides with views of Bull Run Mountain and the horse fields. A private entrance/exit onto the back patio and pool/hot-tub area. The Rose Room is the largest room on the second floor of the main house. It has windows on two sides and has a great view of Bull Run Mountain. The Sunflower Room is a bright and sunny room. With windows on two sides, it has great views of Bull Run Mountain and the horse pastures. The Violet Room is a wonderful room with dormer windows and thick walls in the oldest part of the house. In fact, it was the sleeping area of the original house, which was a log cabin. This room has windows on three sides with a view of Bull Run Mountain. 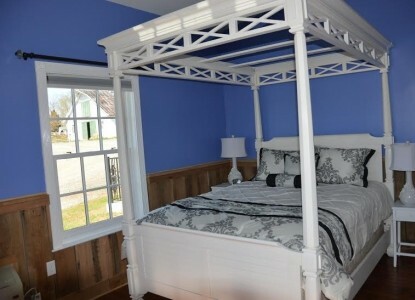 The Hyacinth Room is a lovely blue bedroom with a view of Bull Run Mountain. The Lily Room, a cozy room in peach. This turquoise room overlooks the pool. The Rooster Room is in the newly constructed Chicken Coop building. It is a large room with a sitting area, private bath, TV, and door to the outside near the pool. The Hen Room is in the newly constructed Chicken Coop. This fully handicapped accessible spacious room has a sitting area, private bath, TV, and door to an outside patio. The Chick Suite is in the newly constructed Chicken Coop. This 2-room suite has a bed, desk, & TV in the bedroom and a pull out sofabed, comfy chair, & TV in the living room. It also has a private entrance/exit. 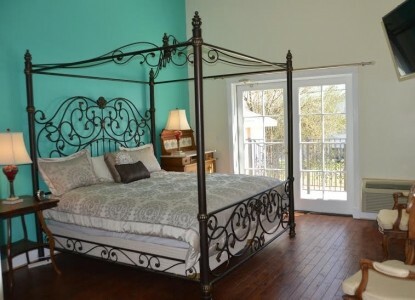 Whether you are planning a family vacation or a romantic weekend getaway for two, you will find our Virginia accommodations to be the perfect place to escape for a time. If a reservation is cancelled 10 days or less before the arrival date, the cost of the reservation is forfeited unless we are able to re-book the room(s) or you wish to apply it to a future stay. No shows (cancellations without notice) will be charged the entire amount of the reserved stay. Reservations of three or more rooms require a thirty day cancellation notice. See the weddings page for details on the weddings cancellation policy. A full breakfast is served on weekends. A continental self-serve breakfast is provided weekdays in the large kitchen or outside on the patio weather permitting. 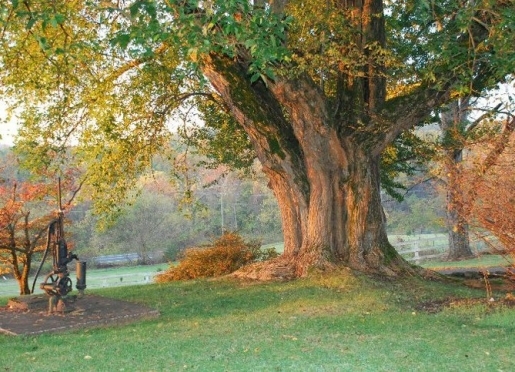 Briar Patch is an ideal setting for a myriad of events including family reunions, company outings, small conferences or retreats, birthday or anniversary parties, as well as weddings. Bring in your own caterer or talk to us about our recommendations. Special discounts for non-profits, religious organizations, and government agencies. Thank you for making an inquiry about staying at Briar Patch Bed and Breakfast Inn.